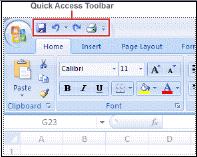 How to customize the Quick Access Toolbar (QAT) in MS Office 2007 and add commands to it? Office 2007 offers a toolbar that is very similar to the Quick Launch toolbar that we know from Office 2003. It can be customized separately for Excel 2007, Word 2007, and the other tools. It is probably the most helpful customization for Excel 2007 and Word 2007. This solution is however limited because there are only a small number of commands you can add in this way. A better way to get some specific buttons to the toolbar would be to really customize it. The Office 2007 let's you do this. You can also get here if you right click the Quick Access Toolbar (QAT) and choose Customize Quick Access Toolbar. A screen with functions appears. Choose a command from the left-hand side of the screen that you want to add to the Quick Access Toolbar (QAT) and click Add. The list of commands that you see in the menu on the left might not show what you are looking for. That is because Word 2007 or Excel 2007 is showing you only the most popular commands. There are many others you can add. Click the drop-down menu under Choose commands from and select All Commands. Select the option you are looking for. You can also change the order of the buttons in the Quick Access Toolbar (QAT) by highlighting a button on the right side of the screen and using the Up and Down arrows to move it. There is one super easy way to add a command to the Quick Access Toolbar (QAT). Right-click any object on the Ribbon and choose Add to Quick Access Toolbar. You can add entire groups of commands this way.